It is oddly hot and humid for late September, so this is exactly the kind of day I didn’t want to spend driving all around town and walking across long parking lots. Unfortunately, not all of the retailers here in Jacksonville seem to share my enthusiasm for Civilization V.
In total, I checked out two Game Stops and two CompUSA stores. At the first three stops, no one working there even seemed to know exactly what I was talking about. 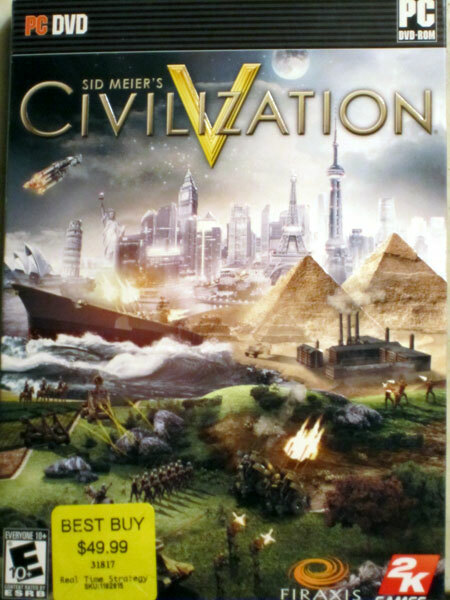 At the second CompUSA, an employee confirmed that they did not expect a shipment of Civ V. Luckily, that store was just around the corner from a Best Buy and they definitely had plenty in stock. They also had some of the collector’s editions, but I just can’t bring myself to drop $100 on a video game. If you’re interested though, it comes with five metal figurines, a two CD soundtrack, and a hard-cover art book. Now, I love to support Sid Meier, Firaxis, and 2k games for consistently delivering on my favorite franchise, but I figure I’ll be doing that with all the optional addons and expansions that are sure to come out as this game gets more developed. Most people will probably be downloading the game online from Steam, but if you’re like me and you like to have a physical box, be sure to head over to Best Buy. As an added bonus, the box is manufactured with the environment in mind, so you don’t have to feel too guilty for creating more material products. It is not like I’m going to throw the box away or recycle it anyway, it is going on the book shelf as soon as I find some space! Well it looks like the installation is just about all wrapped up. I’m going to go get started on this game, and I might even be able to get a full review of it out in the next few days. OK, maybe I’ll need a week!